Contact 3D-PT for your business and education needs. 3D-PT is a 3d printing service that will help you understand 3D printing. From CAD to final print, 3D-PT can work with you to learn everything about 3D printing. 3D-PT can help you develop a STEM program for your school or maker space. 3D-PT with prosthetic hand. Photo by Brian Be. 3D printing provides an amazing platform for people with disabilities. 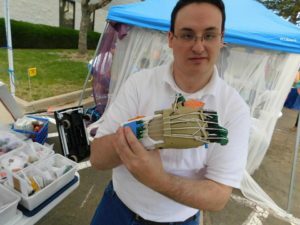 From affordable prosthetic hands to individualized solutions, 3D-PT is a full range 3D printing service that can work with your unique needs. 3D-PT is a company owned and operated by Stan, a science teacher with 10 years of teaching experience. Stan is also on the Autism spectrum, and has a unique knowledge of how to work with others on the Autism spectrum. 3D-PT is unique as a small business owned and operated by someone on the Autism spectrum. It is also a unique service that offers 3d printing services. If you want a true teacher to provide hands-on education for 3D printing, look no further. 3D-PT works with Wings over the Rockies Air & Space Museum to provide their 3D printing program, and can bring this program to your home school, scout troop, or business. Two banners. 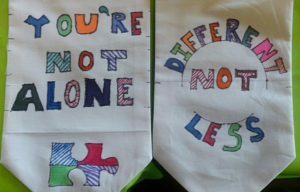 On the left is “You’re not Alone”on the right “Different Not Less” banner and photo by author. Pikes Peak Inter agency Transition Team Resource fair. April 18th, Colorado Springs, CO.
Autism Resource Fair. May 19th. Autism Community Store, Aurora CO.
CHEC 2019 Homeschooling conference. June 13-15th with iqLess. Colorado Tiny House Festival. June 21-23d, Brighton, CO.
People’s Tiny House Festival. August 2-4th. Fountain, CO.
Wings Over the Rockies 3d printing programs. Lesson plans for sale on Teacher Pay Teacher. FREE 3D printable .stl files on Eagleknot‘s Thingiverse page. FREE 3D Quote android app. 3D printed items and castings are available on Etsy.